Our ability to help people with diabetes is thanks entirely to people like you. When you click and view sponsor ads, purchase from our store, or make a direct donation to one of the many wonderful programs we highlight and support, you produce results like these. Thank you for your support! With your help, GreaterGood was able to send over 200 diabetic children from ages 5 to 16 to special diabetes camps across the U.S. Some financially-challenged families have more than one child with diabetes, and these donations were able to help one family with three diabetic children attend camp. These camps help teach children how to manage their disease and are an invaluable bonding experience. How does attending a special camp help kids with diabetes? Many children with diabetes feel different or out of place and dependent on others for help. At camp, kids like Gracie (who wrote the letter below) learn they are not alone. Hi! I'm Gracie! I am 14 years old and I have had Type 1 Diabetes for 8 years. Some of my hobbies include dancing on a competitive dance team, hanging with friends and spending time with my family. I am a Freshman in High School and diabetes has not stopped me from doing anything I wanted to in school. I have attended camp for the first time in 2010 (I was around 7 years old) and it was truly one of the best experiences I have ever had. Camp will always have a special place in my heart. I have met my best friend there who I stay in contact with throughout the year. Camp makes me feel like I belong to a community that others can't be. It is extraordinary feeling to have others around you finally know what you are talking about. Camp has taught me so much like how to change my pump myself, socialize, and how to accept myself with my illness. If you could help me get to camp, it would mean the world to me. Camp does, unfortunately, cost a lot of money that we just don't have right now. One the other hand, the reward of camp is that you have a week of being around people who go through the same daily struggles you do. If you could even take me into consideration, that would mean so much to me. Thank you for your kindness and I hope that you can help. 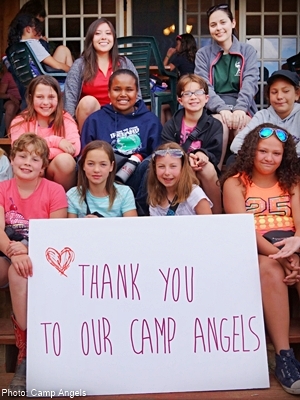 Do more to help Camp Angels, and other programs supported by GreaterGood and The Diabetes Site!